A fruit of many names, the serviceberry is also referred to as the juneberry, saskatoonberry, sarvisberry, shadberry, wild plum, or sugarplum plant. In mid-June (...right around now!) they begin to ripen, turning dark red or purple, and can be picked right off the branch to eat or preserve. What To Do With Lesser Loved Seasonal Veggies Like Kale or Spinach? Saute leeks, onions, kale, garlic, and any other veggies you are trying to use up in olive oil. Add spinach, a pat of butter, cover and cook an additional 5-7 minutes until spinach is soft. Mix everything together, drizzle with EVOO, cover with feta and feel virtuous! 4. combine parsley and fennel shavings, drizzle with EVOO, lemon and salt, top with pine nuts. Here is a recipe for one of my favorite things to do with the end of the season glut of cherry tomatoes. 1. Place the tomatoes in a thick bottomed pot and begin cooking over medium flame. 2. Mash with a potato masher. Once they have begun looking like sauce, use an immersion blender to puree (optional). 3. Add the ginger, salt and lemon. 4. Now add your sugar- you have some leeway with the quantity of sugar- you want to add enough that the color and texture of the jam changes and looks more like jam and less like tomato sauce. 5. In general you can estimate around a cup of sugar per cup of tomato puree. 6. Now cook the mixture down until it reaches the texture you are looking for. 7. I put a few little plates in the freezer and when I think the jam is ready I test the texture by putting a spoonful on a frozen plate, returning to the freezer for a couple minutes and then tasting. This way you can both assess the ultimate texture of the finished jam as well as adjust the seasoning. Most of us get distracted at some point in the season and fail to harvest some of those cucumbers- it’s hard to keep up with them when they really start fruiting! Here is a solution for those overgrown, seedy slicing cukes that are no good for pickling or salads. I like to serve in a small glasses with a crouton on top but it tastes just as good in a bowl! 1. Mix cucumber, shallot, yoghurt, minced herbs and garlic, salt, honey and lemon. 2. Blend in a blender or use immersion blender to puree. 3. Mix well and allow to sit for an hour or more. 4. Adjust consistency and seasoning as needed. You can use milk or veg stock to thin it out. Ever wonder what to do with beets? Well, this colorful root crop starts sizing up in late spring and can be grown all summer and into fall. Options for preparation are diverse and numerous but this is by far my favorite! 1. First remove beet greens, wash well and put back in the fridge. 2. Trim tails and noses off beets and put in pot of water. Simmer on the stove for approximately 45 minutes or until fork tender (you can also steam them if you prefer). 3. While the beets are still hot, put them into a bowl with cold water and use your hands to slip off the skins. 4. Once the beets are skinned and cool enough to handle, slice them and put them in a bowl. Sprinkle them with the oil, honey and balsamic vinegar and salt and pepper. 5. Next, put them on a sheet tray and roast in the oven at 400 degrees for approximately 10 minutes. 7. Now spread the cooked greens on a plate or platter. 8. Next remove the roasted beets from the oven and carefully arrange on top of the greens. 9. Lastly, crumble feta cheese all over the dish and serve warm. Mmmm.... one of the best parts about early summer is the currant harvest. You can do many things with your currants, but we can't get enough of this quick and easy jam recipe. It’s early June and the kale that was planted in April is now big and beautiful but has not yet turned leathery or bitter with heat. My favorite kale for this time of year is the Lacinato or Dinosaur kale but I have some curly as well. (In the fall, I love the red kale after it has survived a frost and is coarse and sweet). With the first days of heat the strawberries are starting to ripen. Meanwhile, we are still enjoying the last tender spinach leaves of spring before the spinach gets too hot and bolts. At this point in the season Edible Eden's gardens are overflowing with tender lettuce heads and salad mix as well as spinach, radishes, arugula and kale: what a great time to eat some beautiful salads! Here is a special fancy salad for a light spring meal that really takes full advantage how pretty butter lettuces are! Asparagus season is upon us, and it's such a treat. Asparagus is one of those crops that really speaks to a seasonal eating lifestyle. It pops up for such a short growing window- from mid-April through late May in our climate; and when it does it is so tender and delicious. Oh dear members of my tribe, especially the kosher keepers, but even the less-then-kosher keepers, who grew up keeping kosher and now just kind of avoid pig products for no clear reason... Do I have a treat for you! First of all, some brief thoughts on bacon- ok, the non-Jews eat it for breakfast. Fine. But beyond a chewy sweet crunchy salty breakfast experience, beyond bringing a smoky rich flavor to your legumenous soups, even forget for a moment about the way roasted squash reaches new hights with a strip of sizzling meat in it's cavity... there is nothing in the world quite like a BLT. (That's Bacon, Lettuce, Tomato for the uninitiated). Something about how the creaminess of the Hellmans' mayo brings out the sweet acidity of a perfectly ripe summer tomato, the meaty crunch of the bacon juxtaposes with the lesser crunch of a mild stack of lettuce, and it's all encompassed in the sweet embrace of a suitable bread. It's not just a sandwich- it's an icon, it's an experience. And folks- it is now available for the Jewish pallet. So go, go down to the Bethesda Farmers market and seek out that character of a kosher bacon seller Hayim. Buy a package of his kosher lamb baaacon. If you can't find him email him at lambbaaacon@gmail.com. (yes it is star k kosher and yes it is made with Grow and Behold free ranging lambs). 2. Spread thickly with Hellman's mayo. 3. Now thickly slice a room temperature, heirloom tomato either freshly picked or picked up from the farmer's market. 5. Now arrange the bread, mayo, tomato, baaacon, and top with greens. 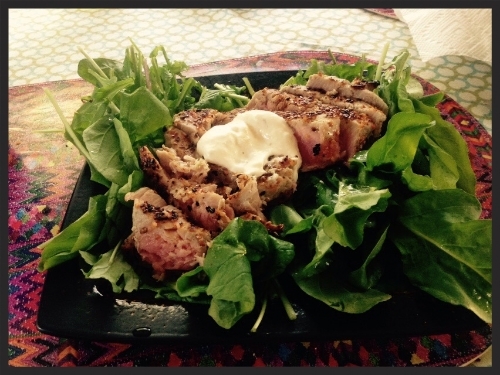 I like to use arugula for an added peppery bite. Romaine works just as well. 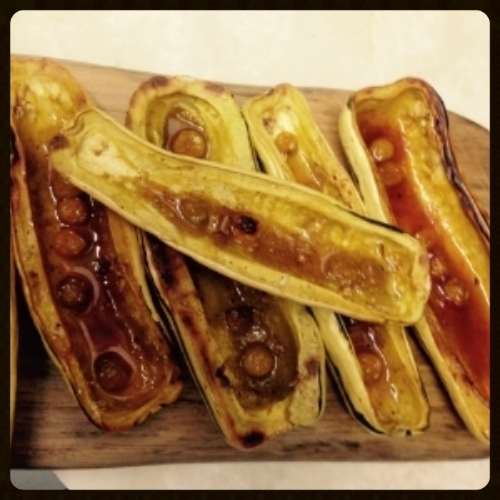 Josh's delicious recipe for roasted Delicata squash with ground cherries. This cooling gazpacho alternative is great with spicy tacos, stir fry or as an appetizer.